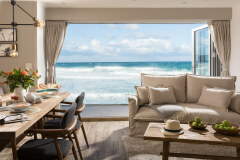 However you like to holiday, check-in to Beachside and live your very best holiday life from this wonderful coastal home. 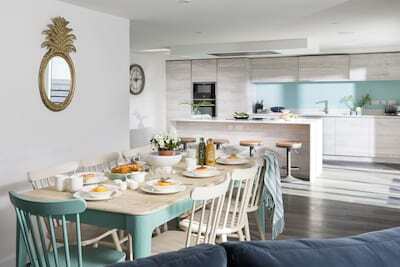 Beachside has recently been created with luxury in mind, from the pared back Scandinavian inspired decor to the first class furnishings and open plan layout. Choose from 3 sumptuous bedrooms and 3 bathrooms, relax in the light and spacious living area and get creative in the modern kitchen. A suntrap courtyard garden offers private space to sit and enjoy al fresco dining. 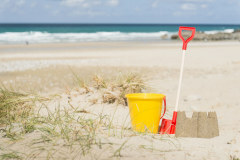 Step from your holiday door to sandy shore in minutes as the golden sands of Holywell Bay beach can be accessed along the lane leading into the sand dunes. 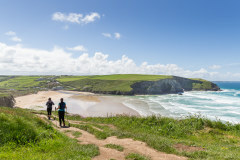 From this magical location on the North Coast, day trip up and down the coast to Cornish hotspots including Padstow, Newquay and St Ives and the stunning beaches of Crantock, Perranporth and so many more. 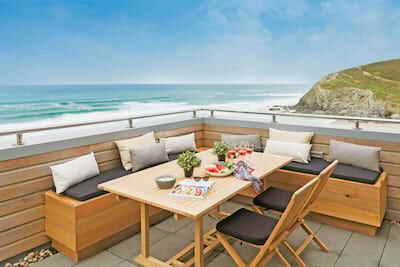 Beachside is a recently built mid-terrace holiday home from home set over 3 floors. 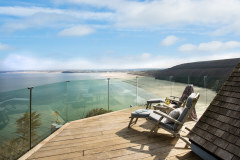 Arrive to the tucked away location in the heart of Holywell Bay, offering superb beach access. Step inside at ground floor level where the first of the bedrooms (bedroom three) is located, a beautifully dressed room with a cool coastal colour palette and complementing artwork. A family bathroom is also located on the ground floor and a separate utility room. Climb the bespoke wooden staircase to the first floor where the open plan layout of the kitchen, dining and living area becomes the hub to your holiday days. 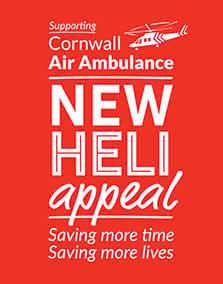 The modern kitchen offers all you could need for the perfect holiday menu with a Cornish twist and ensures the happy cook can join in the group conversations. The dining table is set beside the Juliet balcony for that inside/outside ambiance whilst you dine. Spend your days relaxing on the sofas as life flips between the beach and your Gem. Bedroom two is also located on the first floor, a beautiful super king bed (with a twin option) and ensuite bathroom. Up to the second floor and the sumptuous master bedroom awaits offering sea views from the Juliet balcony and ensuite bathroom with drench rain shower. A cosy snug room on the second floor is the perfect place for children to play and escape the adult chit-chat or for guests to enjoy a quiet evening with a good film. Beachside offers a large suntrap courtyard garden located to the rear of the house, steps lead down from the kitchen to the private area which is safe and enclosed for children and dogs to play. 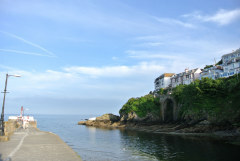 Dine al fresco from breakfast to supper at the smart dining table, with Cornwall firmly on the foodie map then you are never far from the finest artisan ingredients. The courtyard also offers a great place to stow your wetsuits, surf boards, bucket and spades. Aptly named, Beachside, is minutes from the wide stretch of sand dunes and beach at Holywell Bay, walk just 2 minutes down the lane and sink your toes into the softest sand, Holywell Bay is part of the National Trust and is one of North Cornwall's most breathtaking beaches. 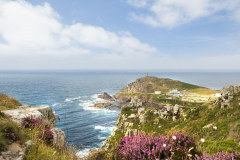 BBC's Poldark has enjoyed many years filming against the natural backdrop. 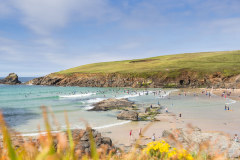 Surfers will enjoy the waves whilst little ones can paddle in the shallows. 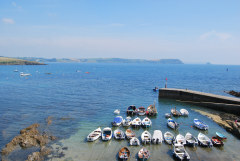 The local pub welcomes family for a local ale and slap up suppers or head to the Smugglers Inn at Cubert for a wider menu. 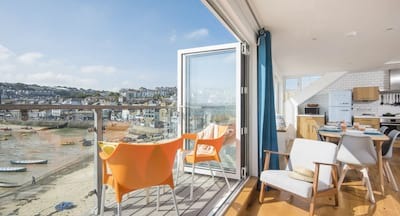 The local is perfect to explore, from the surf culture of Newquay to the North to the arts culture of St Ives to the West, however you like to holiday the luxury of Beachside location is perfect in all seasons. There is level access from the parking area to the front door. Please note the parking height for the car port is 2m 26cm. There is an additional space outside without any height or width restrictions. There are 3 steps down from the kitchen into the paved garden area. Beachside is set over 3 floors. There are 2 internal flights of open-tread stairs with handrail. Mobile reception is limited within the area, please refer to your mobile provider. Beachside includes WiFi.